It’s not very often you see a legendary NWOBHM band play in the back room of a small pub, in a small town, in North East England. Especially one that had such a notable and huge influence on the likes of Metallica, undeniably one of the biggest metal bands ever and even covered and recorded a cover of their self-titled classic anthem on their ‘Creeping Death’ EP way back in the early ’80s, playing it live well into the touring cycle for ‘Master Of Puppets’. Along with bands such as Angel Witch, Diamond Head, Raven and Venom, Blitzkrieg were at the forefront of the early ’80s burgeoning heavy metal movement and have been recording albums, playing live and touring ever since. This was the second time the band played The Penny Gill, a small lively rock/biker pub in Spennymoor a small ex-mining community in County Durham. This was a no airs, no graces affair, as close and personal as you can get; no stage, barriers or security separating the band from the fans. There was no support band either, this was merely an intimate warm-up show for the Garage Days Revisited festival in London a week later and what those in attendance were treated to two hours of pure Blitzkrieg. The band played a very energetic set featuring songs spanning their 30+ year career, from more obscure songs to the obvious set closers and fan favourites such as the aforementioned ‘Blitzkrieg’ and ‘Buried Alive’, as well as an original Satan song ‘Pull The Trigger’ and songs from ‘Unholy Trinity’, ‘Absolute Power’ and ‘Back From Hell’ amongst others getting an airing including the rousing Judas Priest worship of ‘Call For The Priest’. 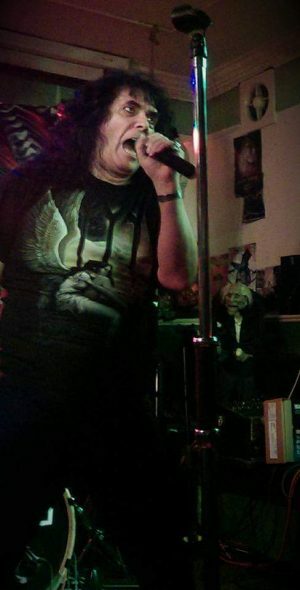 Frontman Brian Ross (also currently of Satan), as always, was on fine vocal form, his trademark falsetto soaring through the speakers, his vocal delivery note perfect. He was also, as always, very chatty between songs and really engaged with the crowd. Backed up by a band who are clearly very passionate and well-rehearsed, his son Alan Ross was around for the ride with longtime bandmate Ken Johnson providing a very sharp and tight duel guitar attack, feeding off each other in unison. The rhythm section were solid and provided a strong backbone. The band as a unit were an obviously well-oiled metal machine and played as if they were playing a much bigger venue, an excellent example of a band playing live for all the right reasons, fuelled by a passion for the music and clearly enjoying every minute of it. There were some obvious die-hard fans in the audience, singing along, raising fists, throwing horns and making the most of seeing the band in such surroundings. It was, for me, an honour to be able to witness Blitzkrieg play live in a small rock pub in my hometown twice in the space of eight months. Much respect to the owners of the pub Woz and June Myers for making it happen. Unfortunately four nights after this gig took place landlord Woz tragically lost his life suddenly when he was killed in a motorbike accident. He was a man passionate about his pub, rock music and riding bikes. The North East live rock music and biker scene has been left shellshocked and extremely saddened by the passing of Woz who touched the hearts and minds of many people with his enthusiasm, dedication and personality.